The story of peaceful community activism to prevent baby Asha from being returned to detention on Manus Island has been celebrated. It is right and good that the outpouring of community — and professional — goodwill has at least delayed the return of the infant to what are reported to be the terrible conditions of the detention centre on Nauru. Despite individual 'wins' — such as the baby Asha decision — Australia's asylum seeker laws (and policies) involve unresolved systemic issues. As happy as I am for the temporary reprieve for the infant Asha and her family I cannot help but wonder if wins for individual cases, as important as they are, fail to gain any traction on the central issues. Refugee campaigners have, for example, increased the profile of individual asylum seekers, lately exemplified by the release of names and photos of babies due to return to Nauru. This is an important strategy, to humanise the people who are being harmed or are likely to be harmed by the Australian government's policy of detention. And, by all accounts, it has been successful in garnering public support for these small children. My concern however is that this strategy is indicative of a fragmentation of asylum seeker debate in Australia. Lowy Institute polls indicate that six out of ten of Australians support mandatory detention. It is difficult for refugee campaigners to get public support for a broader campaign about asylum seekers or mandatory detention, and the support for the named infants, including baby Asha, may indicate a threshold of suffering beyond which the Australian public is unwilling to accept. There are however multiple layers to the plight of asylum seekers in Australia, and a reprieve for Asha cannot fix the system. It is almost as if there is what I might describe as a 'pyramid of suffering' of those who imperil their lives to save their lives. At the base is war and persecution in the asylum seekers' homeland. They run the risk of drowning at sea, and find themselves in detention in Australia. But Australia has shifted these people offshore, where the island detention offers them no escape — and is coupled with institutional cruelty. Women face sexual violence, children face forced removal and severe mental health issues, and babies likewise are in an inappropriate and unhealthy environment. The discourse in Australia has struggled to find its level in this pyramid, and there is a lot of talking at cross-purposes. The government speaks at the 'drown at sea' level, reflected in its 'stop the boats' mantra. The public — according to the Lowy poll cited above — seems to accept this rationale for the policy, and turns a blind eye to the allegations of institutional cruelty. This is made easier by government control over information, by the corporatisation of the detention centre 'services', and by its outsourcing to a foreign jurisdiction. The 'truth' is hard to come by. 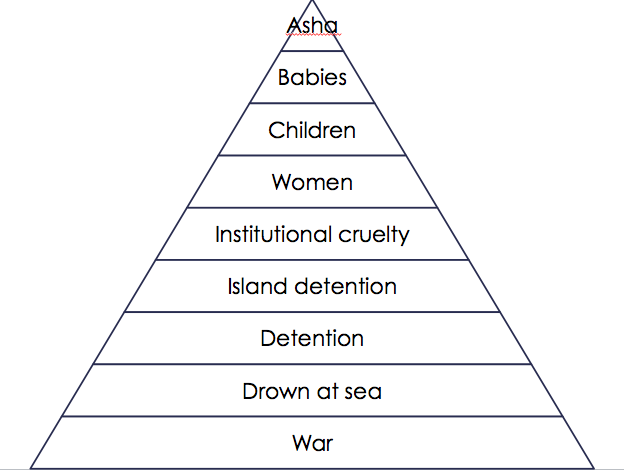 It is only at the very top of this pyramid — here represented in the individual of baby Asha — that there is apparently more widespread community support. At this individualised level, the systemic issues of the layers below become real and unpalatable. But the solution to the individual's suffering is, of course, an individual one. The underlying problems remain. 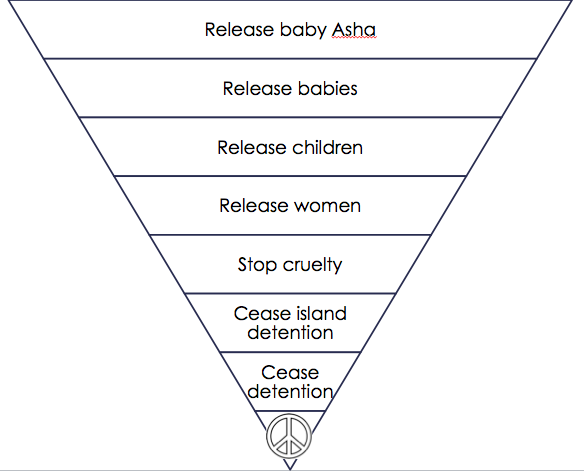 In contrast, the response to the reality of detention in the person of baby Asha can be depicted as an inverted pyramid. In this example, the 'win' is the release of the baby. There might also be further action in support of the release of all babies, and even of all children. Occasionally support galvanises around women — or particular women — but activism seems to decrease as the pyramid itself reduces. In a triage sense, it might be logical for government and for community activism to target the 'stop cruelty' level. This would require community to recognise the systems that cause suffering to individuals, and target them. Even those in favour of a system of mandatory detention should be able to get behind a movement that sought to uphold the dignity of humans, and to hold government to account. For government, targeting the institutionalised cruelty would involve administrative policy of openness and transparency, including admitting media scrutiny and legal and medical assessments. At an administrative level also, government would expedite claims for refugee status. Government and its service providers should, at this level of 'triage', improve accommodation and living standards, and provide effective personal security for all residents, appropriate grievance procedures, adequate medical facilities and care, and so on. In other words, while government — and its bipartisan supporters — negotiate a sustainable and suitable alternative to detention, it can dispense with the egregious systemic aspects of the detention regime that themselves create suffering. Sadly, it no doubt suits the government's overarching policy position for activists to wear themselves out fighting for individual justice while leaving systemic abuses and obfuscation in place. Despite the logic of upholding the most basic dignity for the vulnerable in government care, the pyramid of suffering is wielded as a tool of state oppression in the cruel execution of government policy. Following 14 years in practice as a property lawyer, Kate Galloway commenced as a legal academic in 2004. In May 2016 she will leave James Cook University to join the Bond University Faculty of Law. This article first appeared on her blog. I agree the problem is systemic, and should be tackled at that level. But how to take action? Does the writer have any ideas? When the government has huge resources (ours!) who can take them on? Giving names and faces to the asylum seekers does help, I am heartened by the individual response in marches and protest, and there should be more of this, to influence public opinion and inform our leaders of the continuing opposition to maltreatment of asylum seekers. The main influence I wield on the government is my vote - roll on the next election! Kate points that central to the tragic circumstances of detention, especially offshore detention, are "unresolved systemic issues" As she recognises, focusing on individuals, especially a baby who is suffering, touches the heartstrings of many. The people who consistently rail against detention must be becoming weary as they continually hit their heads against the proverbial brick wall (Dutton). Haven't activists already tried the "stop the cruelty" stand? We just get the message that drowning at sea is cruel and these people are being incarcerated to deter others from drowning and to uphold the bipartison policy that no asylum seekers arriving by boat will settle in Australia. We are aware that the detainees suffer cruelty at the hands of security guards and others, it's so difficult to prove while they are kept isolated physically and in secret. There are some witnesses, whistle blowers who have been prepared to speak out but this doesn't seem to have had much traction so far. Indeed there are Australians, the percentage of which I don't know, who don't care that detainees suffer; they just want them to go away. Professor Owler, President of the AMA is being vocal in his criticism of a system that is inhumane. Perhaps we need leaders in all professions to speak up about the cruelty that is being inflicted people who have come to us for refuge. At present the argument goes in circles. We need a change of policy but six out of ten Australians are against such a change. The only possible way through this labyrinth is for the Greens to win enough seats in the next elections for Labor to be dependent on them for policies. How likely is that! The "egregious systemic aspects" are easily removed. Determining what a "sustainable and suitable alternative to detention" is is the question. If community release to live on Centrelink benefits triggers another surge, the blockade holds if they can be diverted to dry land elsewhere. If Indonesia refuses to accept them, the perceived inhumanity of turning people around to flounder on the high seas will finish the blockade. Far from being robust, blockading is fragile, depending on how prospective customers of the people smugglers feel about the risk:reward ratio, about the probability of paying a lot of money only to be turned round and put into the hands of the Indonesian authorities. The blockade being hostage to Indonesian willingness to 'accept' the returning boat people, the only thing Australia can do is apply some psychology to dissuade people from even thinking of the boat path to Australia. If that's immoral, perhaps someone should ask why our government doesn't simply allow a prospective asylum seeker to take a bus to the Australian embassy in downtown wherever, step onto Australian soil and claim asylum. Why make people travel when Australia is just a bus ride away? Or is some deterrence good? Thank you Kate for your notification about the need for refugee activists to advocate as it were at a higher level. For us who support those seeking asylum we need to find a more dynamic strategy to elicit openness and transparency from Government sources. I hope Kate that you can write a further article to assist us humble advocates who need wiser methods so that we do not speak at cross purposes. Well done Kate and peace and blessings be with you.